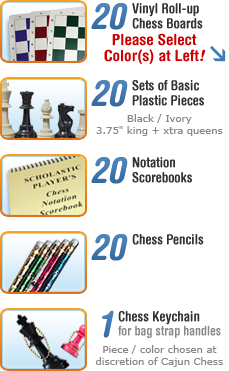 CAJUN CHESS is proud to offer its exclusive "Combo-20" Pre-packaged Coach's Tournament Gear Bag for the special introductory low price of only $250! And the best part? it's pre-packed for you with standard regulation tournament gear . . . for only $250!! !